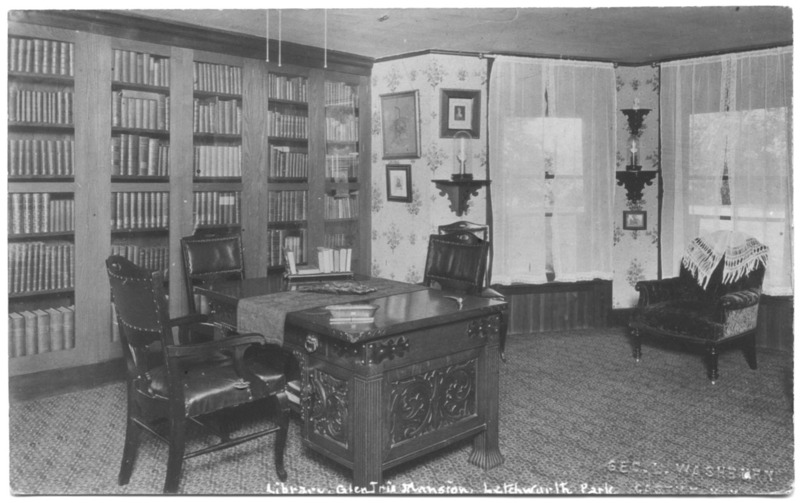 One of William Pryor Letchworth's favorite rooms in the Glen Iris his library. The library was located in the 1830s section of the Glen Iris, where the gift shop is now. Although taken somewhat later, this image probably captures the room as it looked before Mr. Letchworth's death in 1910. Some of Mr. Letchworth's extensive library can be seen. His library included works on Genesee Valley history, general history, literature, and many volumes related to his social reform work. A majority of this collection was moved to the newly completed Museum not long after this image was taken. For many years visitors could view the works on the shelves at the Museum. Recently they have been removed, conserved, and placed in archival storage for preservation. To this day they provide important insight into the Park's remarkable benefactor. Scroll down for an enlarged view!